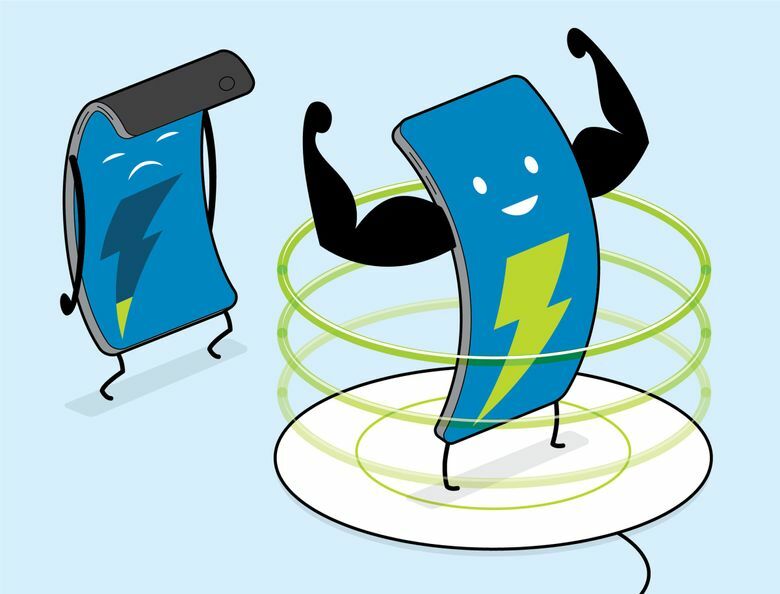 Wireless charging of phones is here, so what is it good for? As a longtime skeptic of wireless chargers, I was eager to find a useful application for the technology. So I scattered the chargers around the focal points of my daily routine. Here's what I found. Many people are excited about charging without cords. A study by SurveyMonkey found that wireless charging was the most anticipated feature in last year’s new iPhones. Yet in a survey by the research firm IHS, only 29 percent said they used wireless charging last year. That may be because wireless charging isn’t truly wireless. People typically need accessories from companies like Samsung, Mophie and Anker — which generally look like mats and stands that you can set your phone on — to wirelessly power up. And while you don’t have to plug a cable into the phone, the accessories themselves have to be hooked up to a power outlet. Charlie Quong, vice president of product development for Mophie, said placing wireless chargers in areas where people spent a lot of time — like their bedroom, car and office — could enable them to top off their phones more frequently by removing the hassle of plugging in. As a longtime skeptic of wireless chargers, I was eager to find a useful application for the technology. So I scattered the chargers around the focal points of my daily routine: on my nightstand, in my car, in my briefcase, on my office desk and on a living-room table. In the end, I would consider keeping a wireless charger only in the bedroom or in a briefcase. Here’s what I found. Two types of wireless chargers can be placed on a bedside table: pads and stands. The pad is a disc, and you lay your phone down on it. The stand keeps your phone upright so that the screen faces you while it charges. I tested a Mophie charging pad and Anker’s PowerWave stand. In this case, the charging stand was beneficial. It elevated my phone at an angle to turn the phone into an alarm clock — with a quick poke at the screen, I could glance at the time, disable an alarm or look at a calendar alert. At night when the lights were off, setting the phone on the dock was easier than fumbling around for a wire to plug in. And the slower charging didn’t matter, because I was asleep. A wireless charging pad or stand can also be placed on an office desk. The idea is to quickly set your phone down on the charger whenever you return to the desk. Wireless charging is less productive. Wireless charging isn’t beneficial in an office environment, assuming you care about speed and productivity. If you want your device to stay charged between meetings, the slower speed is inconvenient. In my test, the Anker stand took about 10 minutes longer to replenish 25 percent of battery than a wired charger. For when you’re on the go, Mophie offers rectangular battery packs with built-in inductive charging. All you do is place your phone on top of the battery pack. Conveniently, the battery pack does not have to be plugged into a power source, making this one of the few truly wireless power products. A wireless battery pack was great for date night. During dinner with my partner, it was nice to skip carrying a cord. We set the battery down on the table and took turns recharging our devices. A wireless battery pack was less practical while on the move — like when I was sitting on public transportation — because I could not easily use the phone while charging it. Fortunately, Mophie’s wireless battery pack includes a port to plug in a power cable for those times. You could place a charging pad on a TV stand or end table for guests to replenish their phones when they come over. It’s not only convenient and hospitable, but it also looks less tacky than dangling cords all over your common areas. For cars, accessory makers offer wireless charging mounts that can be attached to air-conditioner vents or CD player slots. I tested Mophie’s mount, which clipped to an air vent, with two adjustable arms holding the phone in place. To power the charger, I had to plug in a wire through my car’s accessory port. Quong said the mount was conceived as an all-in-one solution, eliminating the need to buy two separate accessories for mounting and charging a phone. But given the high price of $70 for the Mophie mount, I recommend going piecemeal. Plus, a wire was still involved anyway.